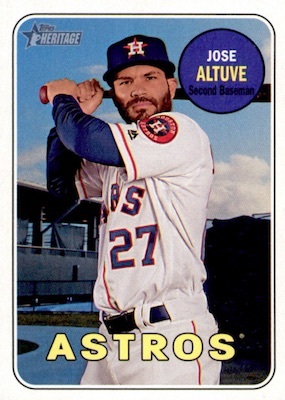 Even Bryan Adams would approve of 2018 Topps Heritage Baseball thanks to its homage to 1969. The retro release sticks with a format that offers one autograph or relic per box, and a box loader. 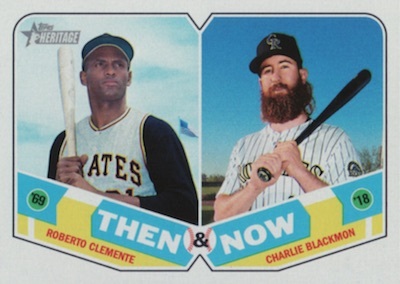 Moving on from '68 Topps via 2017 Heritage, the 2018 Topps Heritage Baseball checklist relies on 1969 Topps for many of the design elements. Update (Feb. 13): Topps revealed that the first Shohei Ohtani autograph card is found in 2018 Topps Heritage MLB. He also has a variation card, exclusive to hobby packs, that puts his pitching skills on display. A base hitting card is planned for 2018 Heritage High Number later in the year. Displaying the trademark '69 look of a white border, larger team text and a circular player name section, the 500-card base set includes 100 High-Numbered Short Prints (1:3 packs). Base subsets fill out the large assortment with League Leaders, Rookie Stars, Topps News All-Stars and World Series Highlights. The parallels include new 100th Anniversary (#/25), which has a foil stamp showcasing the MLB batter logo worn in 1969, and Magenta Backs, with just 10 copies. There are also hobby-only Black-Bordered (#/50) and Flip Stock (#/5) parallels. That's not all as Chrome versions apply to 100 subjects, adding Refractor (#/569), Hot Box Refractor (Hobby and Retail Blaster), Black Bordered (#/69), Gold Bordered (#/5 - Hobby only) and SuperFractor (1/1) editions. Shrinking the size, Mini versions are limited to 100 copies. And then we get to the 2018 Topps Heritage Baseball variations. This year offers familiar options like the rare and valuable Throwback Uniform Variations, as well as the hobby-exclusive Action Image, which includes Shohei Ohtani, and Team Name Color Variations. Boasting on-card signatures once again, the Real One Autograph set provides the base blue ink for past and present subjects. There are even players from the '69 set. Substituting red ink are Real One Special Edition parallels, numbered to 69 or less. Hand-numbered Real One Dual (#/25 or less) and Triple Autograph (#/5) cards also return, but only in hobby formats. 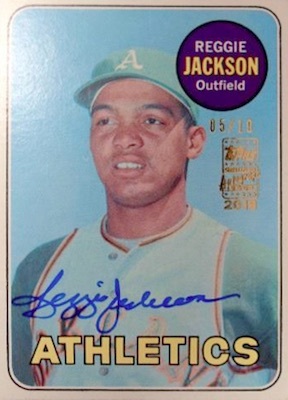 New surprises include hard-signed Reggie Jackson Buyback Rookie Autograph (#/10) cards, in addition to Seattle Pilot Autograph cards for players from the 1969 expansion franchise. Pairing on-card signature and memorabilia piece, additional signed options consist of Clubhouse Collection Autograph Relic (#/25 or less), Clubhouse Collection Dual Autograph Relic (#/10 or less - Hobby only), and Flashbacks Autograph Relic (#/25 or less) cards, which document a notable performance from the 1969 season. There are also one-of-one Autograph Patch parallels for each, found only in Hobby boxes. 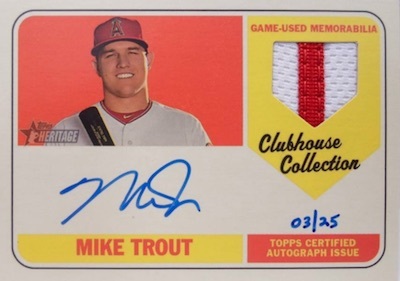 Continuing the brand's typical memorabilia theme, Clubhouse Collection includes single Relic, Dual Relic (#/69), Triple Relic (#/25) and Quad Relic (#/10) offerings. 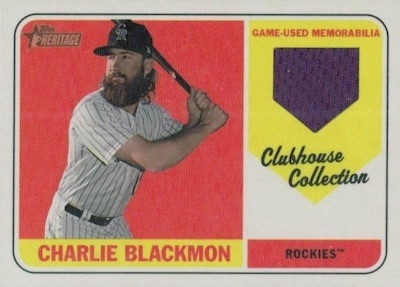 These each have a Hobby-only Patch parallel, as well, while only the main Clubhouse Collection Relic set features a Gold version, numbered to 99. 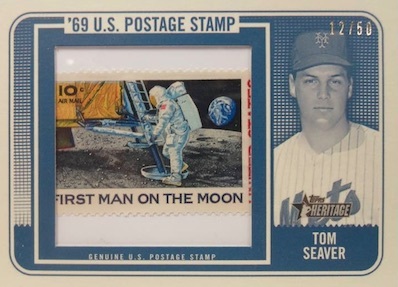 Diving directly into the bygone era, other relics include 1969 Mint (Hobby only), with a mix of numbered '69 coin options, 1969 Stamp, featuring a '69 postage stamp (#/50), and one-of-one 1969 Cut Signatures for stars on and off the diamond. Finally, the 2018 Topps Heritage inserts don't stray too far from the path, as brand staples Baseball Flashbacks, News Flashbacks, and Then and Now are each back at 1:20 pack odds, but with a 1969 focus. Only featuring current stars, New Age Performers is more common at 1:12 packs. Going further into the honored set, 1969 Topps Deckle Edge (1:10 packs) brings the distinct vintage design to modern players. Exclusive to retail packs, 1969 Topps Bazooka All-Time Greats tackles current stars using the 1969-70 Bazooka All-Time Greats design. Literally topping things off, a trio of loaders await collectors who are opening hobby boxes. The most common are the 1969 Topps Bazooka Ad Panel cards, while more limited options come as 1969 Poster Box Loader (#/50) and foil-stamped 1969 Topps Originals. Byron Buxton 2018 Topps Heritage Red Ink Auto 69 Twins !!! 500 cards, including 100 short prints (1:3 packs). LL = League Leaders, CL = Checklist, WS = World Series Highlights. PARALLEL CARDS: Black Border (50 copies, Hobby), 100th Anniversary (25 copies), Magenta Backs (10 copies), Flip Stock (5 copies, Hobby). See full details and a gallery in our variations guide. 100 cards. Serial numbered #/999. Shop on eBay. 132 cards. Serial numbered #/100. Shop on eBay. PARALLEL CARDS: Special Edition Red Ink - #/69 or less. 8 cards. Hobby only. Serial numbered #/25 or less. 4 cards. Hobby only. Serial numbered #/5. PARALLEL CARDS: Nickel #/15, Dime #/10, Quarter #/5, Half Dollar 1/1. 5 cards. Serial numbered #/69. 12 cards. Serial numbered #/25 or less. 5 cards. Hobby only. Serial numbered #/10 or less. All box loaders are exclusive to hobby. 1 per box. 15 cards, with 2 versions for each. 30 in total. Back player image noted first. Fronts show one of two different 3-card panels per card. 30 cards. Limited to 50 copies. These are stamped buybacks from the 1969 checklist. View the 2018 Topps Heritage Baseball checklist spreadsheet. View the 2018 Topps Heritage Baseball checklist PDF. Good: On-card signatures; first Topps Ohtani autograph; Heritage Chrome still pops. Bad: Expensive box price for one hit; too many variations; tougher odds across the board. The Bottom Line: While 2018 Topps Heritage Baseball does offer a lot of potential, the box price is steep for one hit that is likely to be a relic. Also, production is up based on the increased odds for most cards. The excitement around Ohtani has pushed box prices even higher, so most would benefit from zeroing in on exactly what they are after before they dive into sealed boxes. 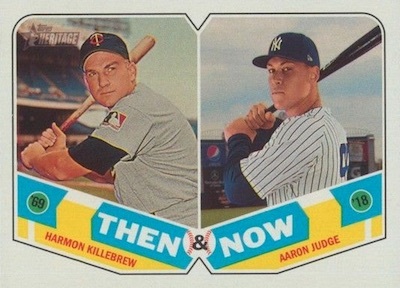 Celebrating 1969, 2018 Topps Heritage Baseball is much more my speed compared to the '68 design used in 2017. The simple base design works with rounded edges, a thick, white border, and bulky team text. I admit it's not the most exciting design and it certainly feels dated, but in a good way. As far as my favorites, the Chrome cards add a modern flair, but I do wish they were more common than one per box. I am also a fan of the intricate Deckle Edge insert, with die-cut border and facsimile signature. The black-and-white image combined with the blue replica sig really produces a nice-looking set. I still find the idea behind the Mint cards to be a little silly, but I do like these more than manufactured relics. The same goes for the Stamp cards. For the rest of the hits, it's the standard Real One Autographs and Clubhouse Collection relics. 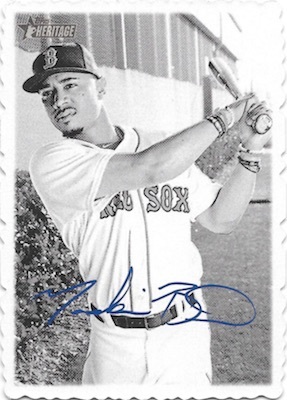 The hard-signed focus is the driving force for many and it is what gives collectors hope even though their box will likely contain a small, one-color relic card. I also wish Hobby had some of the retail-only inserts, as many of these designs are unique compared to something like Baseball News. 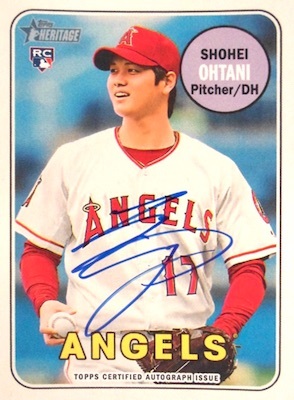 Although Shohei Ohtani was not in the main base set, Topps did include him with the on-card autographs and as a Hobby-only variation, which is a big boost for the checklist. Overall, the list of signers is very solid, featuring names like Hank Aaron, Mike Trout and Rafael Devers. The '69 buyback autograph for Reggie Jackson is also a cool addition. The 500-card base set is truly massive and overwhelming for some. Especially with 100 short prints. But those looking for a nostalgic challenge have found their match. 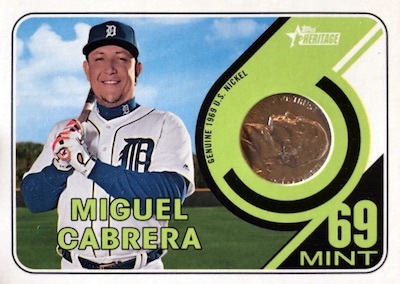 However, 2018 Topps Heritage Baseball could really cut down on the variations as it has gone overboard. Multiple players have five different variations in the set and it's hard to view this as anything more than filler. I'd love to see only 20 or so SSP variations, with just one per player and a theme unique to Heritage. Ohtani alone gives 2018 Topps Heritage Baseball a lot of value. That interest may dip at some point, but there are still more elements such as the on-card autographs, variations and Chrome cards to help even with increased odds. Heritage is not your normal gamble product, but at the current price of around $170-190 per Hobby box, it is very risky for just one hit. There are other things that can help the value but it takes a lot to justify this price and the most likely outcome is one Chrome card, one relic and one Action variation. Otherwise, you are just hoping for a huge pull. That makes value very tough to achieve. Since I like the simplicity of the 1969 design, 2018 Heritage was more enjoyable for me. I also like that Heritage has a lot going on. All the little things really add up and there was just enough rarity in the review box so that I did not feel like it came up short. It’s still planned for 2/28 and now added to the calendar. 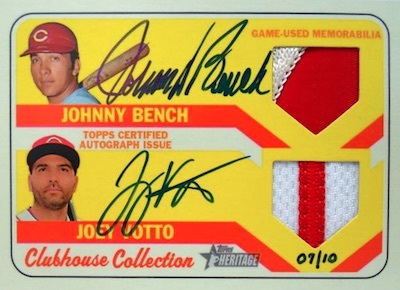 I love Heritage, but $90 is a lot to spend when you only get 3-4 autos per case. If we were guaranteed one signed card per box, I’d buy no question… Maybe it’s just me, but the relics aren’t on the same level of coolness as a signed card. Steve that $90.00 a box is for fools who buy from the E-bay clowns. Their box breaks and other ploys have almost ruined this hobby. It seems it’s only about money anymore. There are dealers and shows in my area that sell this product at a much better price. Look around before you buy from a clown. There are still honest sellers out there. ONE non relic/auto insert and FIVE SP of lousy players. 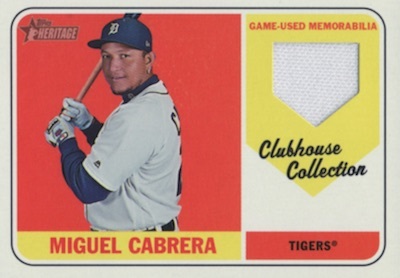 The Tigers have only 4 base cards. Is it possible to give this release zero stars? Tiger fan here too. It’s not Topps fault that the Tigers have gutted their roster of card-worthy players. 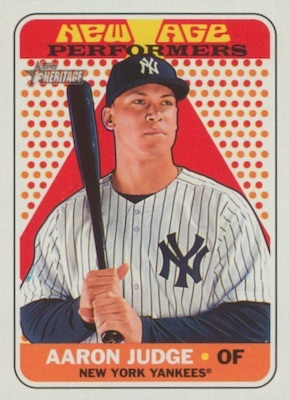 It also seems that Topps is not reserving the SPs for star players like in the past (I figured a player like Aaron Judge would be a SP for sure). That should bring the price down for individual card shoppers like myself. Overall, the sample cards I’ve seen look nice – crisp portrait photos. Hurrah!!!!! Hurrah!!!!!! 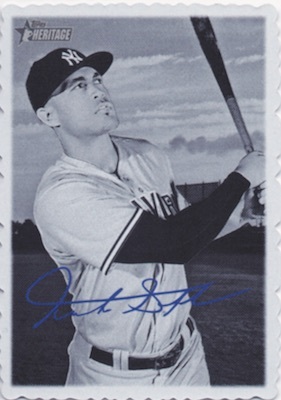 Topps did not short print all the Stars in fact they short printed very very few. Finally!!!!!! Though Hoskins and Devers should have gotten there own card. Is the list for the ’69 poster set checklist correct? It says 30 cards with 50 copies each but the list has 330 different players. 11 players per poster for all 30 teams equals 330 total players. Each team poster has 50 copies. Never mind – I figured it out. I opened up some retail packs today. Lots of errors in this set, most notably the American League Batting leaders card that has Hanley Ramirez as a leader, instead of Jose Ramirez. Hanley hit.242 last year. Jose hit .318! Cool looking product, really like the feel of the packs. Quick question though. 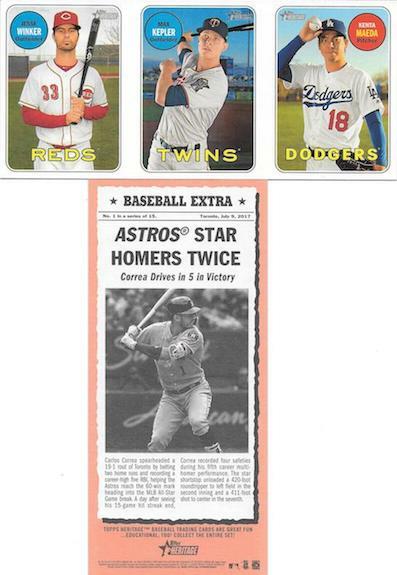 I pulled a harper “The Topps News” National League All Stars insert and the back has an image of a dodgers jersey. Is this a common error? whats the print run? 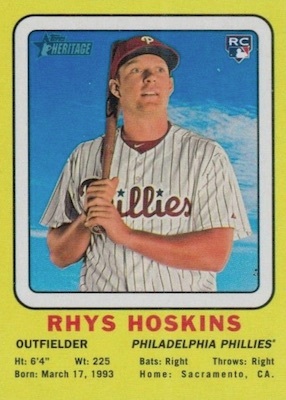 Topps 2018 series 1 was mass produced and i fear Topps is printing cards like its 1988 again. I wonder what the prices would have been. 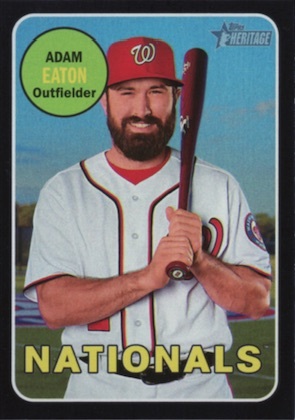 I do love the Heritage cards but wish Topps would slow down on the sub-sets, way too many and the intentional variations. It’s getting to the point where you can buy the set cheaper than you can build it and that’s no fun. A little disappointed with the increased odds on the Chrome’s this year. I don’t mind the increased odds on the Variations. I agree with others here that Topps can cool it on all of the different types of variations…it’s getting a little excessive. I love the texture and feel of Heritage cards – makes me feel young again. I went out and bought 3 boxes yesterday @ $120 per box with the intent of opening 2 boxes and holding onto one to see if the price goes up as the supply dries up. 2 relics for the hits…and I thought I was done with my 2 action image variations…but then I got a Bryant Error variation. So I guess you can get multiple variations in a box. I don’t think many people are going to be getting their money back out of their box now unless they get a very rare parallel, or an Ohtani…but I still love Heritage. I’ll probably lose patience and end up opening my third box too…my wife’s gonna kill me. Hi Trey or anyone else who can help me. What do Topps mean by 50 copies, or 25 copies, etc.? Is it a sort of a serial number? P.S.I’m new with baseball, hence my question. Normally these would be numbered. However, Heritage does not do this. For these parallels, the print run is limited to the numbers referenced. For instance, Flip Stock is not serial numbered, but there should only be five copies for each card. Found an error in production on card #1 2017 batting leaders. Put Hanley Ramirez on the card instead of Jose Ramirez for the batting leaders. Does anyone know if this was corrected. 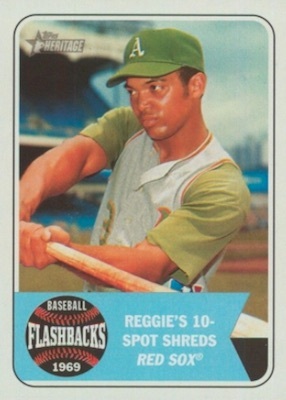 I see that the “regular” Reggie Jackson autograph card is the same reprint card used in the 2012 Archives set, unlike the two actual 1969 buyback cards I have seen on ebay that were autographed by Reggie that are a much better photo…New technology I guess. Cards are meh.. but pulled an Ohtani SP card out of only box I opened, so I can’t complain too much. As a Mets fan, was hopping for inserts to commemorate their WS win. Only change I’m going to make this year is not buying the chrome. 1. Hammer- where are you finding $85.00 boxes? 2. Am I the only one who would prefer a material (esp. a limited material with some flair) (not bat!) over an indecipherable scribble players call an autograph these days? 3. I’m always happy when they increase odds on inserts/short prints/variation pulls (see Josh on Chrome above). Doesn’t make sense to me to build interest in the hobby esp. for kids by making cards harder to get. 4. I love the fact that they did save all the stars for the short prints in the last 100 cards. Really bothered me to spend all that money to build a base set (yes, I still do that) and not have any of the good players! [I have not gotten my boxes yet so I will hold off on my actual star rating (required)]. I give it 4 stars. Everything is great except the cards all look alike. 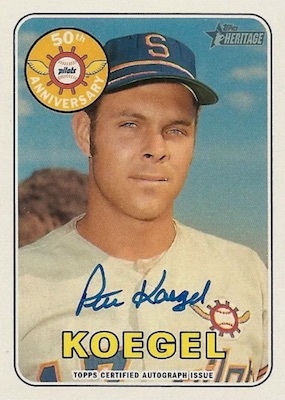 1969 was an expansion year and Topps hadn’t gotten any new photos in a couple years, so there were a ton of head shots. Think Al McBean, Jose Herrera, Woodie Held. The 2018 are almost exclusively taken at the same angle with no variation. That knocks off one star. I hit my target in the am hoping for blaster boxes but for some odd reason they where delayed so all i had to work with was 6 hanger boxes. The dude that was stocking them gave me 30% off of them for the delay in blasters. After opening them i was quite pleased with my pulls. I love building huge base sets and thankfully the judge base card wasnt so short printed like it was in series one 2018 topps. Overall quite an enjoyable rip and getting a sp per hanger makes it really worth the trip. I just saw a couple of the dual autograph cards of Lou Brock and Steve Carlton and they look great. My question for New York based Topps is why didn’t they include either a dual or triple autograph card of the World Series winners, the Detroit Tigers, rather than the World Series loser’s, the Cardinals? Excellent set. Lots of stars and of course variations, which I like. Got a deckle edge card of Cody Bellinger. It looks like a real autograph on the front, but also hard to tell. Nothing in the description above indicates these are autographed. Is this autograph for real or a facsimile? Thanks again for your help. Deckle Edge has a blue facsimile autograph. pulled a Judge Rookie Trophy error sp from a Target blaster. Some are calling the trophy error cards ssp, but I’m not seeing any distinction in the release materials??? 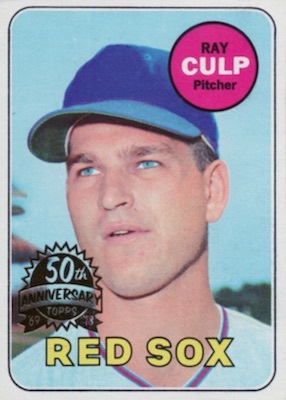 U was wondering if Topps would replicate the thinner card stock like the original ’69s. Finally held a few in my hand and the stock is pretty thin, even thinner than the originals I think. Also the finish of the cards is kinda dull, almost matte-like. I don’t think this will go down as the best Heritage set. 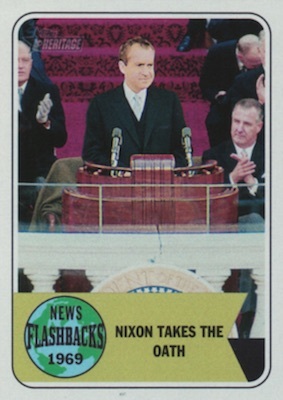 Next year, we get the ’70s w/ the thicker card stock and a chance for Topps to atone. Also a little disappointed in some of the carelessness w/ Flashback images. A two-tear-old pic of the Beatles that gas nothing to do w/ the Abbey Road LP? 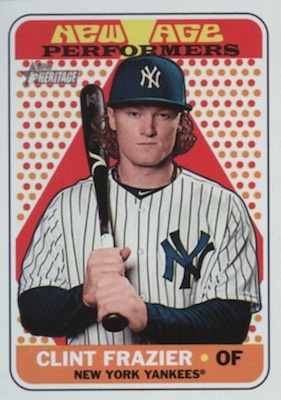 Kinda shoddy, Topps. Sorry for the typos in above comment. What a bunch of hot garbage ! Shame on you Topps, over $90 a box and not a guaranteed Auto. Ridiculous. Most cases I’ve seen barely have 2 autos per case. Another thing, for us older true collectors and fans of Vintage cards, what’s the deal making the codes on the back so small, you can’t read the things to confirm whether or not you actually hit some SP or not. Pathetic..
Sean P. The boxes I bought were in Cincinnati, the person I deal with buys factory direct. Topps did increase the prices per case but not to the $90.00 to 100.00 level some are trying and getting plus shipping. One shop in Cinti. is asking $135.00, I feel this is a joke and will never buy there. I also agree with you 100% on the real crappy so called autographs Topps puts out, if you can’t write your name they should not pay you. The real problem is who really scribbled on the card the player named or WHO ?? A lot of collectors are getting really upset with Topps. I believe in 2020 their MLB license is up for grabs and Panini may just grab it, that would be a sad day. I like Topps and their history but it seems like they no longer think about the long time set builders only money and E-Bay. Last time I’ll every purchase this garbage. 1 autograph in an entire case, and a ton of horribly centered and beat up cards. I wouldn’t buy a box of this ever again. Even if you hit something decent, you run a decent chance of the card being beat up or terribly cut. I reserved a case in November at my LCS at what I thought was a fair price at that time. It turned out to be a great price once it was announced Ohtani had cards in it. No Ohtani, but no disappointment either. Best hits were Aaron Judge Nickel, Jim Bouton Seattle Pilots Auto & Francisco Mejia RC Auto. I have to give it five stars based on my experience. Typically I love the Heritage collection. In 8 hobby boxes I’ve had zero autographs and eight low-end relic cards. I’ve had some nice pulls – Ohtani, a few action image cards, and a nice Bryant player name error variation. 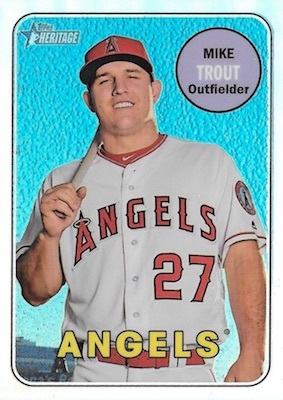 My question – Any insight from Topps on the player error variation counts? Seems like there are quite a few already for sale on e-bay. I’m thinking these cards might be more numerous that w e think.One other point…it would have been nice if Topps could have mixed these cards a little better. Seems every pack with Sonny Gary on the front finishes with Johnny Cueto. Takes the fun out of things. 3 stars, Don’t like how Topps chooses who the All stars are. Perez was the leading vote getter for catchers and was the starting catcher in the all star game. topps News all star catcher. Sanchez. Who was injured and or having a horrid first half of the year. But hey, he’s from new your will make him the star. The front of the cards look good, but topps screwed up on the back, card numbers hard to read, stats in bold print. At $115 per box or $5 pack, I hope topps does much better with 1970 heritage. This could have been 5 star product if they did back of cards right. 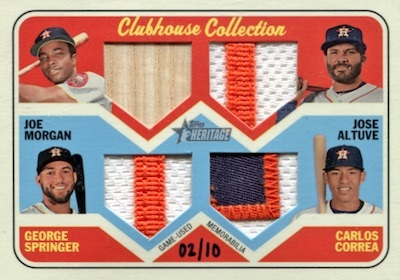 I give heritage 3.5 stars you get some good pulls. but the price is a little overflated due to othani who is getting lit up like a Christmas tree this spring. look at today he gave up 7 runs in an 1inning including 2 home runs. Anyone see that Jose Reyes is the only player in the set with no “Major League Totals” bottom line on reverse of card? Was this a miss on purpose? On all the others that have played forever (Rodney, Pujols, Sabathia, the ‘t’opps logo upper left was sacrificed to make room for the totals line). Reyes got the logo, but no career totals. Odd. Worst hobby box I’ve ever opened. This was my first of 2018, and I’m going to try a second box this week. Best card in the box was the base Clubhouse Collection Gary Sanchez, which wasn’t even numbered. If this next box is as poor, I won’t purchase another one. For $120, I expect more value for my buck. This was reminiscent of opening a box from the 80s and 90s; endless amounts of commons with no production limitations. Topps, do a better job of Quality Assurance with your products. Fantastic product . I’m a set builder and can’t get enough of this product . It takes over 2 cases to build the set ( even then you’ll need to buy some singles to fill in ) but i want it tiotake months not days to complete .I pulled some pretty pricy cards along the way too . This set isn’t for everyone . Huge hits are spread thin so it’s not really for big hit seekers . Autos are also spread thin which is a good thing as I like to chase them until they are in my collection ,which also means less people are going to build the set . Ebay has made building sets boring as I can get any card I want while lying on the couch .I enjoy the Hunt !! I read most comments how people are not satisfied with what they pulled , and that happens more often than not . Or how they won’t be buying any more , we’ll good it will make my set worth more then . I have 1-500 with all inserts , now I’m working on action variations , nicknames , team color swap variations , then on to chrome ……… 5 Stars !!! I have a question about the buy backs in this series. I pulled some Mike Fiore/Jim Rooker in my case 1969 Stars Rookies. I checked on eBay to see the value and I only saw one copy sold and no others on sale. Are they that rare? I don’t seem to find any info about this. 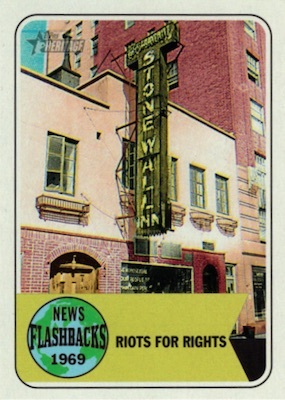 It’s a stamped buyback of the 1969 card. These are part of the 1969 Topps Originals box toppers. Yes, I know that Trey, but my question is if they are rare or not. As I explained in my initial message, I have seen non on eBay, but I pulled 6 in a single case. Was this normal, or there was a distribution problem from Topps. I see around 200 stamped 50th anniversary buybacks on eBay from 2018 Heritage right now and another 650 sold listings. I have no idea about the individual rarity of certain buybacks. Excellent series that mixes the classic old feel of baseball cards with today’s players. I’ve had some excellent pulls (both hobby and retail), and this product is very exciting with all the different insert varieties. This is you best bet for Topps Baseball 2018. The 1969 Topps set was the second I ever collected so I love this return to that design. Seattle Pilots autographs are a sad joke (most never even played for team). ’68 Tigers forgotten again from New York Toppers. Note to Topps: there are other noteworthy ’68 Tigers still living besides your predictable Kaline autos & such…. does any one know how many blue ink Shohei Ohtani Topps certified autograph issues were produced – I just pulled one out of my box today!!! 2018 Topps Heritage Baseball Factory Sealed HOBBY Box-AUTOGRAPH MEM+BOX LOADER!